New Year, New You! Oh, no. Wait. Wrong audience. New Year, New Wine? Nope. That doesn’t make sense. Never mind. It’s 2017. Harvest has started. The game is on. I have always loved he old year/new year changeover. In reality, nothing really changes. If you are fortunate enough to take some time off (a few days or a few weeks), you probably benefit from some rest and relaxation, recharging your batteries before diving into the new calendar year. Nothing is really, materially, different though. Most people go back to the same job, the same school, the same routine. Same stuff, different year. That being said, I do find something significant about the mental clean slate that the changeover brings. Like the 31 December / 1 January mark somehow compels us to take at least a moment to either reflect or plan, or both. Imagine for a moment that the wine industry as a sentient being – trundling into January with a moderate (severe?) hangover, plotting New Year’s resolutions, pondering what the year will bring. What gets left behind in 2016 and what gets planned for 2017? • Snub the snobs AND the anti-snobs: It seems that there’s a struggle that has emerged in recent years between the snobs and the “anti-snobs”. The wine snobs comprise the group of wine geeks and a sprinkling of people who don’t really know much about wine but don’t drink anything below a specific price point. The Anti-Snob Squad has emerged as the polar opposite, often rebuffing wines above a certain price or insisting on calling longstanding, prominent wineries as overrated – despite not really making that judgment based on the wine itself. Enough with this lunacy. It smacks of disarray and confusion. Distell’s 4th Street was just revealed as fastest growing wine brand in the world. US wine drinker surveys indicate they love semi-sweet, fruity and smooth wines. At the same time, customers from all over still flock to purchase our iconic wines. And we have the Wine Enthusiast Wine Maker of the Year for 2016. Our bases are well covered, so flinging mud at each other just makes a mess that nobody is ever inclined to clean up. So stop it. 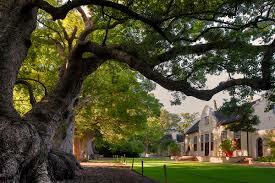 Vergelegen – leading the way when it comes to wine tourism. • Get your house in order: Our eyes are still fixed on international markets – and rightly so – but that doesn’t mean we should neglect home base. A recently released Food & Wine Tourism report (by Wesgro and Explore Sideways) highlighted the importance of wine tourism in bringing international visitors to our shores (wine tasting came up as the top requested activity type amongst those surveyed). This is great news but also brings a great responsibility – we have a reputation to protect, and it relies on every aspect relevant to wine tourism: wine tasting, accommodation, restaurants. If we are going to move forward as a leading light in wine tourism worldwide, there needs to be a focus on upping service levels, rooting out inefficiencies and running a tight ship. • Promote your regions: There has been some stellar work going on by the smaller, developing wine regions in promoting and advancing their routes. Still, many wineries (especially in the larger regions) seem reluctant to embrace the notion of working together, as if collaboration will lessen their own success. The most successful wine regions in the world gained their popularity and reputation by cooperation (Napa just one example). We are definitely moving in the right direction, but the prioritization of the self over the ‘greater good’ could be an Achilles’ heel. In short: play nice, drop the pretense, clean house, always seek to improve. Cheers to 2017.